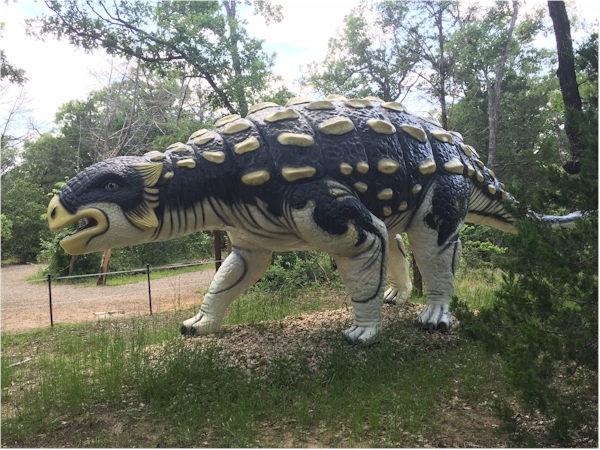 Ankylosaurus is best known for its armor, which protected almost all of his body, including the eyelids! Only his under-belly was not armored. The armor consisted of massive knobs and plates of bone embedded in the skin. These plates are known as “osteoderms”, and are also present on armadillos, crocodiles, and some lizards. Osteoderms are embedded into the skin, not connected to the skeletal bone of the creature. Ankylosaurus is also known for its club-tail, which aided in his defense. He was a very slow moving creature because of his heavy club-tail and full-body armor. Luckily, his nearly impenetrable shielding was all he needed for protection.